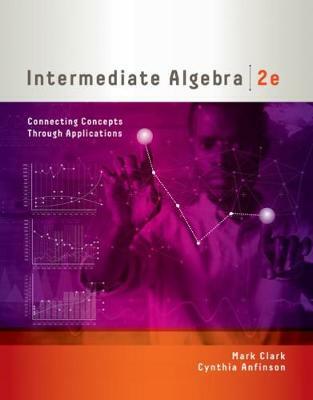 INTERMEDIATE ALGEBRA: CONNECTING CONCEPTS THROUGH APPLICATIONS, 2nd Edition, shows you how to apply traditional mathematical skills in real-world situations. With an emphasis on skill building and applications, concepts are connected to the real world, helping you master the material and enhance your problem-solving skills. The authors have developed several techniques to make the concepts as vivid as possible for you. First, they integrated applications to show you why and how math applies to our lives. Second, the authors use 'Concept Investigations' activities to explore patterns and relationships in the concepts studied. Third, they emphasize the tools needed for strong algebra skills with the Equation Solving Toolkit, Expression Simplifying Toolkit, Factoring Toolkit, and Modeling Toolkit. Fourth, the text underscores the importance of graphs and graphing by having you learn graphing by hand, while technology is used to display real-life data problems.